A new piece of equipment donated to Women’s and Children’s Services at St. Peter’s Hospital aims to help bring compassion and comfort to parents dealing with the loss of an infant. The new Cuddle Cot, which resembles a crib but also includes a cooling device, helps to preserve the body of a baby in the case of stillbirth or fetal demise, and extends the amount of time parents have to spend with their baby. Dealing with the death of a new baby is an incredibly difficult experience for parents and family members, said Sandra Michael, RN, BSN, SNT, MST, CLC, manager of community integration and lactation services in Women’s and Children’s Services at St. Peter’s Hospital. “The Cuddle Cot allows more time for the baby to stay with the parents, as they work through the initial grief process,” Michael said. 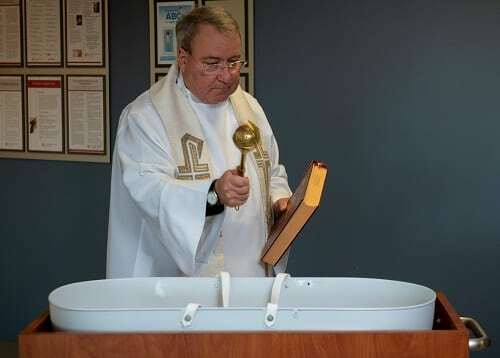 On August 9, a ceremony was held on the third floor of St. Peter’s Hospital to bless the Cuddle Cot, and to thank the donors, Kristin McVeigh-Parente and David Parente, president and vice president of McVeigh Funeral Home in Albany, who generously purchased the Cuddle Cot and donated it to the hospital. McVeigh-Parente and Parente, who had three children born at St. Peter’s Hospital, said they had no hesitation when approached about donating a Cuddle Cot to the hospital. Parente said the Cuddle Cot represents the latest research and most compassionate thinking about infant deaths, and allows the family to spend every precious moment with their baby. Shannon Galuski, executive director of the St. Peter’s Hospital Foundation, thanked McVeigh-Parente and Parente for their generosity. Galuski also thanked Stacy Myron, with the March of Dimes, who played a key role in partnering with St. Peter’s Hospital, and connecting with McVeigh Funeral Home, to make the donation possible.